Wine lovers who prefer a lever-style opener can't go wrong with the Brookstone Connoisseur's Compact Wine Opener, which remains our top wine opener in this year's update. Those with arthritis or dexterity issues will find the Wine Enthusiast Electric Blue Push-Button Corkscrew easy to use, and we recommend the compact, portable True Truetap for those who prefer a traditional corkscrew. Reviewers say the Brookstone Connoisseur's Compact Wine Opener is easy to use and easy on the eyes, too. They appreciate the weighty feel, shiny chrome finish and extra-long ergonomic handle, which gives even those with limited hand strength enough leverage to easily remove corks. 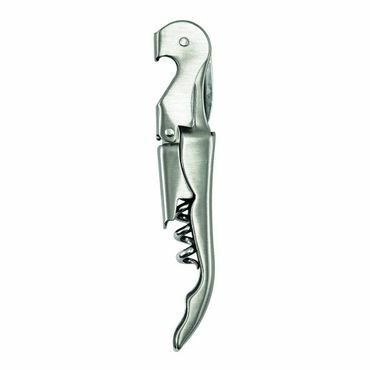 The included foil cutter is sharp enough to cut cleanly, and the wine opener gets good durability marks that other lever-style openers often lack. Wine Enthusiast's Electric Blue Push-Button Corkscrew is a solid blend of value and ease of use, reviewers say. They like the opener's see-through casing and foil cutter, which makes precise bottle openings a cinch, and experts say the unit performs more reliably in testing than its competitors. Another stand-out feature is the opener's soft blue LED light, which reviewers say functions as a handy nightlight in a dark kitchen. Quality and value combine to make the True Truetap a worthy imitator of pricier corkscrews, reviewers say. A double hinge means you'll have more leverage to open bottles, and the worm is able to drill into natural and synthetic corks without breaking them or getting stuck. At only three inches long, the Truetap is also easy for a wine server or anyone else to tote in a pocket. One of the most popular kinds of manual wine opener is a lever style, which works very simply: Press down on a lever and a coiled metal rod -- also referred to as a worm, spiral or screw -- is driven into the cork. Pulling the lever back up removes the cork from the bottle, and repeating the push-pull action releases the cork from the spiral. The downsides here are reliability and price: Lever-style wine openers are prone to breaking over time, and they are expensive compared to corkscrews. Electric wine openers are motorized, battery-powered gadgets that generally come with a recharging base so they're always ready to use. Fans say they're easy to operate -- all you need to do is line them up with the cork and push a button -- but if counter space is an issue, note that they're typically designed to be stored on a countertop and not in a drawer. These are also more expensive than your typical corkscrew. Your least expensive option is the basic corkscrew, which combines a metal worm with a handle that's twisted to drive the worm into the cork, then manipulated to remove the cork from the bottle. They require varying degrees of muscle to use, but you'll certainly need more elbow grease and a better grip than you would with lever-style or electric wine openers. Basic corkscrews can be as cheap as a dollar or two, but they can cost more if they're made of high-quality materials, have a cool design or are engineered to require less effort. Corkscrews are usually the most compact wine openers and can easily fit in most drawers; some even be tucked in your pocket. If you're an ardent wine lover, you may also be searching for a better way to store your wine. If so, check out our report on the best wine coolers if you want to keep those prized bottles at the most consistent temperature to ensure the best possible flavor. "The Best Corkscrew for Opening Wine"
"Which is the Best Corkscrew?" There are a handful of expert reviews of wine openers, but some are quite dated. The most helpful recent reviews include hands-on tests from Wirecutter and Your Best Digs. Food & Wine also conducts hands-on testing of handheld corkscrews in a recent report, and New York magazine consults with sommeliers to identify the best handheld wine openers. Solid but aging sources include articles from Cook's Illustrated and Serious Eats. One of the best resources on wine bottle openers is Amazon, which has thousands of reviews from wine opener owners on how their gadgets fare in day-to-day use. Other good sources for user reviews include Bed Bath & Beyond and Wine Enthusiast. To pick the best wine openers, we evaluated these reviews by focusing on wine openers' appearance, performance, ease of use and durability. The Brookstone Connoisseur's Compact Wine Opener (Est. 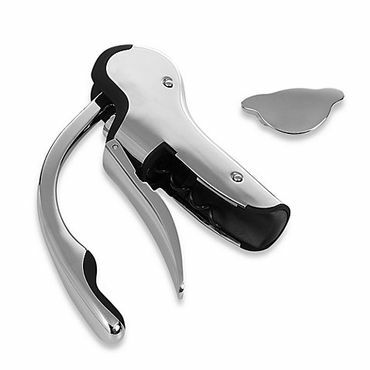 $55) is a great choice if you prefer a lever-style wine opener. It features a solid design and get raves for its ease of use. The Connoisseur features a traditional look: Most of the body is made of chrome-finished metal with a few black rubberized plastic accents. Reviewers say it looks and feels expensive enough to give as a gift, and stores easily in a drawer. It comes with a foil cutter, but not an extra worm or storage case. Few reviewers fault the Brookstone Connoisseur's performance, saying it requires only a few seconds to uncork a bottle of wine. Brookstone says the opener works with both natural and synthetic corks. Most reviewers say they've had no trouble with either kind of cork, but a handful of owners reports problems getting the cork completely out of the bottle, or they say they had problems with particularly firm synthetic corks. On the bright side, the included foil cutter cuts cleanly, reviewers say. The Brookstone Connoisseur has an extra-long ergonomic handle to make opening a bottle of wine easy for those without much muscle or grip strength. A couple of reviewers who have limited hand dexterity due to arthritis say they have no trouble operating the unit, although there are those who say it still takes a bit of effort and finesse to pull up on the handle and properly expel the cork. However, once you get past the learning curve, it becomes easier. Most owners say the unit is durable, with some reporting years of effective use, but there are some scattered reports of stuck levers and loose screws. Brookstone backs the opener with a one-year warranty, and the few reviewers who have dealt with customer service say they had good experiences. 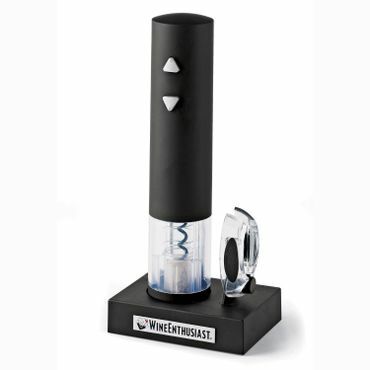 Reviewers are similarly enthused about the OXO Steel Vertical Lever Corkscrew (Est. $40), which shares many of the Brookstone Connoisseur's strengths. One of the biggest differences is aesthetic: Much of the OXO is black, with an easy-to-grip rubberized surface and handle, while chrome figures more heavily in the Brookstone. The OXO comes with an extra worm -- a nice bonus -- and a foil cutter that can be stored directly on the wine opener. Like the Brookstone, the OXO works with both natural and synthetic corks, and reviewers report few issues removing either kind. Most say the opener removes corks with one fluid, easy pump of the zinc handle, and the cork is similarly easy to eject from the worm. The foil cutter, however, gets mixed reviews: While most owners appreciate storing it on the wine opener itself, some say it falls off easily, and several owners say it could be a bit sharper. The rubberized surface on the OXO provides ample space to keep a firm grip on the wine opener during use, which users love. Reviewers say they don't need an inordinate amount of strength to operate the wine opener, making this a candidate for users with limited dexterity. Owners say it feels robust and well-made, and a few say they've put it to heavy use for six months or more and it still works just as well as it did on day one. That said, there are a couple of users who say their OXO broke within a few months of regular use. It's worth noting that OXO products are backed by a lifetime guarantee, however. Has a screw that's at least 1.75 inches long. Can handle all types of corks. Extracts the cork without shaking the bottle.